Hamlet Op. 116 (Complete film score, incorporating the Suite, Op. 116a, arr. Atovmian). 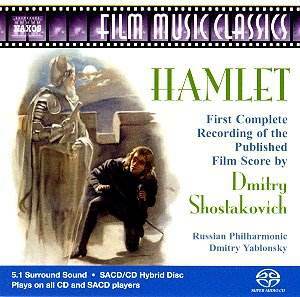 Representing a collaboration between Shostakovich and the Soviet film director Grigori Kozintsev, the music for Hamlet was written in 1964. In addition there is music for the play from 1954. The pull of Shakespeare was indeed strong, yet Shostakovich only wrote music for Hamlet and Lear, two plays that deal with leadership matters (pity there is no Macbeth). Shostakovich�s skill in his task is manifest in a straight play-through of the disc, as the smaller, more immediately functional numbers (e.g. the �Military Music� and �Fanfares�, numbers 2 and 3 of the present disc, or even the �brainless� �The Flutes Play�) contrast well with the more extended sections where Shostakovich�s fingerprints become much more obvious. Billed as �The first complete recording of the Published Film Score�, this laudable endeavour finds the Russian Philharmonic on top form for Yablonsky. The SACD recording is superb, with a true sound-picture possessed of much depth. There are 23 movements, including the Overture. The Overture in fact resembles Prokofiev�s Romeo and Juliet in its reiterated chords, but it is the contrastive theme (Ophelia) that is the most memorable part, intensely lyrical and completely Shostakovichian. In the shorter, more gestural and illustrative movements one is struck by Shostakovich�s ability to conjure up atmospheres in very short spans of time. Interestingly, Yablonsky includes in the �Ball� movement (track 6) more music than there is in the film (wherein the music fades away). Of course Shostakovich�s orchestration was masterly, and that aspect of his art is fully in evidence here. The use of a harpsichord is particularly effective and is not only limited to period evocations although it can appear too closely miked. The Poisoning Scene is a particular highlight (track 16), with its suspenseful use of silence, as are the bare, sparse textures of the penultimate movement, �The Cemetery�. A pity that the final section, �Hamlet�s Funeral�, does not give any real sense of completion, or even ask an interesting question. In truth, it does not carry the emotive weight it might have. Stock gestures do on occasion seem hackneyed. An example can be found in Track 5, �Horatio and the ghost�, with its tremolandi strings and low brass. Yet the overall impression is much more than this. It really came as a shock to realise that one can listen to the whole disc in one sitting, taking the incidental music as a single entity. As the first complete recording, this effectively has the field to itself. The Suite, Op. 116a, which is incorporated into the Naxos programme, has been previously reviewed on MusicWeb when issued on RCA Hamlet Suite, Op. 116a (review : Belgian Radio Symphony Orchestra/José Serebrier). Note that the eight movements (including the overture) that make up the Suite are identified as such by Naxos in their track listing. Do try to hear this. In the final analysis it appears as more than the sum of its parts. Yablonsky�s Hamlet is not just for Shostakovich completists, instead offering a rich tapestry of pleasure.